The house is strikingly modern in form, a departure from much of the architecture found in the region. Yet through the careful discipline brought to its proportion and massing and the use of regional materials that speak to the setting, it is perfectly suited to place. Stone-clad solid volumes with sloped rooflines house the private areas; these are connected by a glass pavilion comprising the public space. A long, cantilevered flat roof—which projects to create an outdoor room—balances the overall mass while echoing the horizontal nature of the site. The home is beautiful, functional, and practical. It makes the best use of an arrival sequence, orientation, and layout to maximize the impact of the extraordinary views and natural advantages of the site. The result is grounded, yet lyrical, its architecture both beautiful and fitting, its interiors ultra-comfortable while still at one with the outdoor experience. The home is a stunning celebration of place, expressing, as Logan puts it, the architecture firm’s “reverence for the land.” It is the result of a thoughtful collaboration between client and architect, and between site and structure—the natural starting and ending point for all CLB designs. 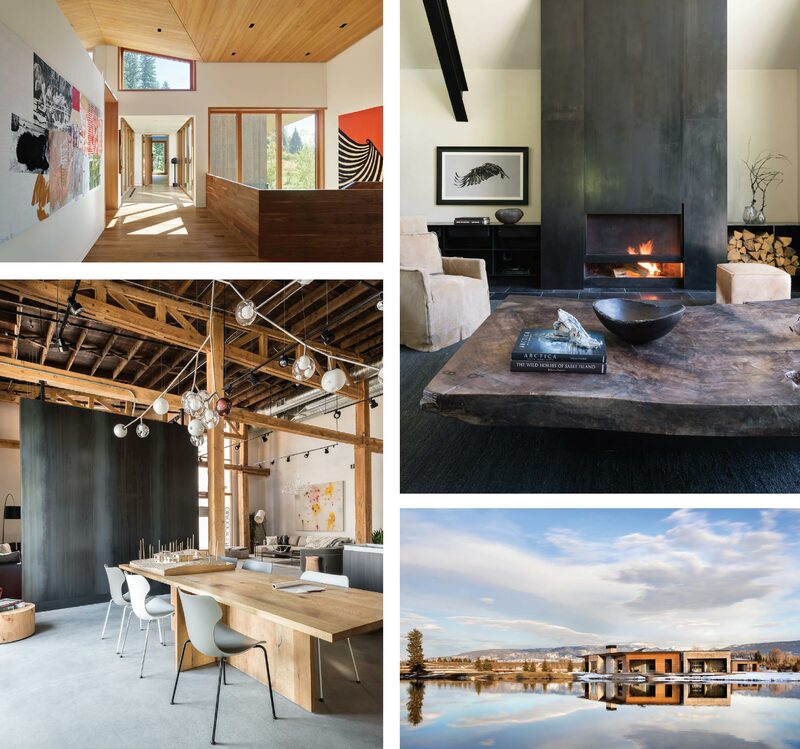 For 25 years, Jackson, Wyoming-based Carney Logan Burke Architects has applied its creative, site-specific design thinking to a wide array of projects. 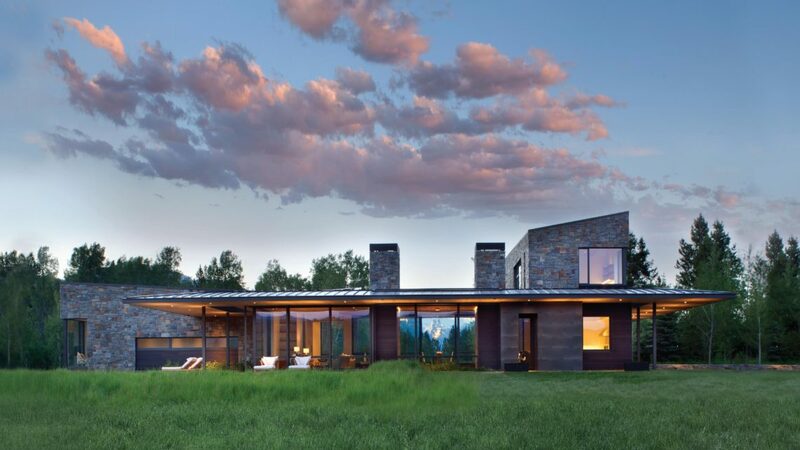 An early leader in the rustic modern movement, the firm has consistently expressed its philosophy—that architecture, especially in the Rocky Mountains, should be responsive to the land—in commercial, civic, and mixed-use complexes, as well as residences ranging from affordable housing and urban infills to luxury homes and iconic ranch properties. Through the decades, CLB Principals John Carney, Eric Logan, Kevin Burke, and Andy Ankeny have made their aesthetic mark on the Greater Yellowstone region while simultaneously giving back by volunteering at many levels of civic service, both in their communities and the design world. Public commissions include the LEED- Platinum-rated Interpreter’s Center at the Laurance S. Rockefeller Preserve; the LEED Silver-designated Jackson Hole Airport; and, most recently, Big Sky, Montana’s recently unveiled Big Sky Town Center. This complex serves as both welcome center and anchor for those who throng to the area’s ski resorts, dude ranches, and fly fishing streams. It has set the style for the next iteration of the mountain town’s evolution even while fulfilling its more immediate mission (through a plaza adjacent to the shop and café, which engages the street with sculptural benches and a fire element) as a lively town crossroads and gathering place. Clockwise from top left: A house built for art collectors. CLB’s interior design conveys warmth through this patinated blackened steel fireplace and organic one-of-a-kind table. A modern home in Jackson makes the most of its lake-edge setting and expansive views. CLB’s new Bozeman office, a collaboration with Denver-based European furniture dealer Studio Como. It is fitting that the 40-person firm was selected to design a key touchstone project in Big Sky, as the commission coincided with the opening of CLB’s satellite office in Bozeman. 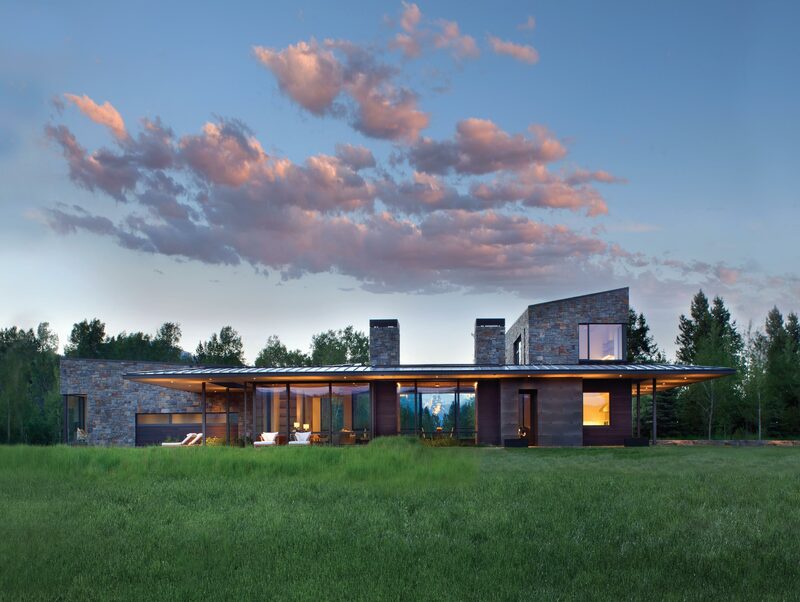 The architects had long been designing homes around the northern reaches of the Greater Yellowstone region; meanwhile, they had become increasingly interested in identifying new opportunities for staff members, especially for those with young families and long-term aspirations within the firm. The Bozeman area, with its brick warehouses, varied agricultural structures, and rich railroad history, offers many opportunities for adaptive reuse, something CLB excels in. And for CLB staffers who attended Bozeman-based MSU, like project manager and Bozeman office head Sam Ankeny, the move would be a homecoming. CLB found the perfect opportunity to express its rustic modern aesthetic in Bozeman’s historic Cannery District. Original brick walls, exposed timbers, high ceilings, and ample light in an old pea-canning warehouse provide a setting conducive to meetings and creative work. The firm’s showroom partnership with European furniture representative Studio Como allows for flexible use amidst stylish decor, while its comfortable seating and contemporary art pieces, courtesy of Visions West Gallery, create a homelike feel. CLB’s five full-time Bozeman employees work next door to a lively café, their ranks often swelling with Jackson colleagues like Jennifer Mei, head of the firm’s interior design practice. This creates a one-stop shopping experience for clients while fostering a creative synergy between offices. As the firm enters its next quarter-century—not only planting a permanent stake in Montana, but sharing its design prowess with the public through its Lift Series custom hardware collaboration with Sun Valley Bronze—it will no doubt continue to evolve while remaining true to its ethos: architecture inspired by place. For more Information, visit clbarchitects.com.